In early August, the World Council of Churches (WCC) representatives will embark on an unusual pilgrimage. A group of church leaders will travel to two cities devastated by the deadliest of weapons 70 years ago, then visit governments still willing to destroy thousands of cities in similar fashion today. 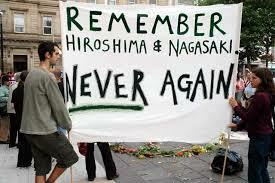 The Japanese cities of Hiroshima and Nagasaki were attacked with atomic bombs on 6 and 9 August 1945. A lifetime after that fearsome destruction, 40 governments still rely on nuclear weapons. Nine states possess nuclear arsenals and 31 other states are willing to have the United States use nuclear weapons on their behalf. Church leaders from eight of these countries will make the WCC pilgrimage to Hiroshima and Nagasaki, where they will listen to survivors, pray with local churches and reflect with other faiths on the plight of the two cities. Then the bishops and church presidents will bring calls for action home from the two cities. One key step is to urge their governments to join a new inter-governmental pledge to “close the legal gap” and establish a formal ban on nuclear weapons. This humanitarian initiative already has the support of 110 countries. The eight member churches involved in the pilgrimage are well-placed to take a stand against the world’s most destructive weapons. Their governments – the US, Germany, Japan, South Korea, Canada, Netherlands, Norway and Pakistan – all avow support for nuclear disarmament, but continue to rely on the very weapons that caused such destruction 70 years ago and pose a threat to humanity today. Except for Pakistan, which has its own nuclear arsenal, all of these governments are prepared for the US to use its nuclear weapons against their enemies. Four accept this Cold War-like posture as members of NATO. Two, Japan and Republic of Korea, do so as US allies in the Pacific. Churches from this group of countries are well-placed to apply ecumenical policy opposing nuclear weapons and exert constructive pressure on their governments today. Current events give this year’s anniversary added significance. Rhetoric about nuclear weapons is being used in the crisis over Ukraine. And last month a major arms control conference at the United Nations collapsed amid strong nuclear-weapon-state resistance to the majority of states which support the humanitarian initiative against nuclear weapons. Most of the church leaders on the pilgrimage are from nuclear-dependent allies of the United States. The humanitarian initiative is consistent with values their governments often espouse. Yet they feel obliged to stand with their nuclear-armed ally, the US, against the initiative. In recent months wide circles of civil society including WCC member churches are increasingly asking these governments a question the church leaders will hear in Japan: Why are nuclear weapons still legal when all other weapons of mass destruction are banned? The mission to Japan and the seven other nuclear-dependent countries is part of the WCC Pilgrimage of Justice and Peace.